My opinion on Turkey was biased. I used to know Turkey only from Kebab shops in St Michel area and workers in Moscow skycrapers. I went recently to Istanbul for a business meeting and I discovered a dynamic, neat, and friendly country. Turkey is so close to Europe and Moscow and I waited so long to go there! How much time lost ! Now I wish I can make up for it. For the 3 days I stayed in Istanbul, I tried several restaurants. Turkish cuisine has nothing to do with what I knew. Instead, Doner kebabs (the sandwich with meat known in Europe as “kebab”) are so juicy and tasty. Turks are real meat eaters! I had wonderful schashliks (called kebabs in Istanbul) in local restaurants, all that for a very reasonable price. You can have a delightful dinner for 30 USD / each, wine included. Istanbul is the largest city in Turkey with a population of 13 million. It is located on the Bosphorus Strait and reaches a natural harbour called the Golden Horn. It extends both on the European side (Thrace) and on the Asian side (Anatolia) of the Bosphorus, being the only city in the world on two continents. Istanbul today has something very similar to Paris. Narrow, cobbled streets, stone buildings, all look like a typical European capital. The area where I lived, Galata, has precisely these features. Galata was named after a Gallic tribe, the Galates. The area main building, Galata Saray, also the name of the Istanbul soccer team, is home to the French high school, which is quite a coincidence! When walking in the streets, you can’t help feeling the history of the city. Several theories explain the name Istanbul. The most plausible is that it comes from the Greek “Polis”. Some say it was named after the founder of the city, Osman Bey, who became chief of a local Turkish tribe during Turko-Mongol struggles in the 14th century. Another theory is that Istanbul means the city of Islam. Some believe that it comes from a slavic word meaning “city” (I can’t recall any slavic words with such a combination of consonants though). Like in the famous song, Istanbul was Constantinopol, the capital city of the Eastern Roman Empire, and before that, the Greek city of Byzantium. During the Middle Age, Constantinople was Europe’s largest and wealthiest city. At the height of its power, in the 16th and 17th centuries, most of North Africa, east Europe and all the Middle East were under the control of the Ottomans from Istanbul. The Great Ottoman Empire lasted more than 6 centuries and ended after WW1, when Ataturk signed a final redefinition of borders of former Ottoman Empire at the Treaty of Lausanne in 1923. But this part is too intricate to be summed up in few lines. I finally managed to get 1,5 h of free time. I hailed a cab. Those are very cheap: about 1EUR/km, and I saw two city’s tourists attractions; Hagia Sophia and the Blue Mosque. Each round wooden disc in Hagia Sophia is painted in black with golden arabic calligraphy on it, representing “Allah”, “Muhammed”, and the names of other caliphs. Hagia Sophia, as it can be seen today, was built in 565 by Byzantine Emperor Justinian. 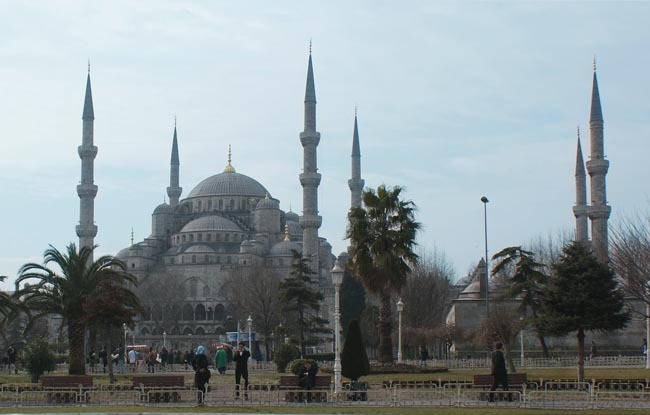 The first cathedral of Constantinople was built in 360 under Emperor Constantine on the very same place. Although it is sometimes referred to as Saint Sophia, as if the church was dedicated to her, in reality, sophia is to be understood as the Greek word for wisdom, and the full name of the church in Greek being “Church of the Holy Wisdom of God”. Famous in particular for its massive dome, It was the largest cathedral in the world for nearly a thousand years. In 1453, Constantinople was conquered by the Ottoman Turks under Sultan Mehmed II. 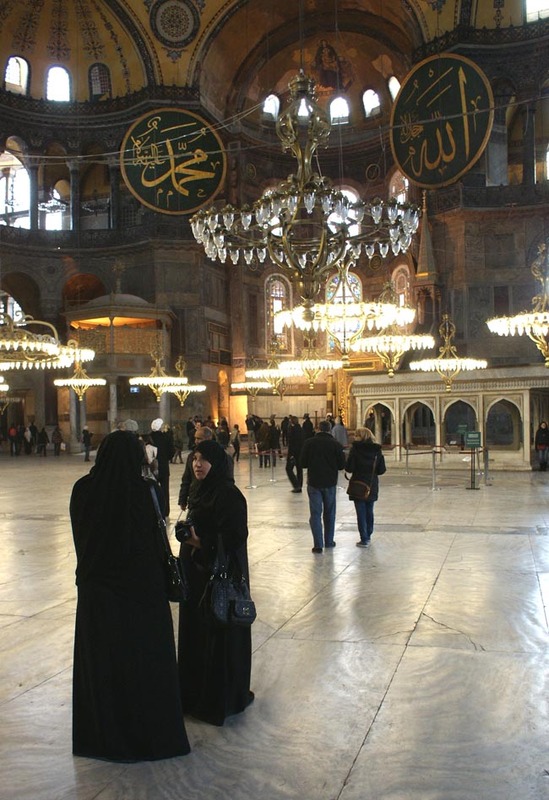 He ordered Hagia Sophia converted into a mosque. The bells, altar, and iconostasis were removed. 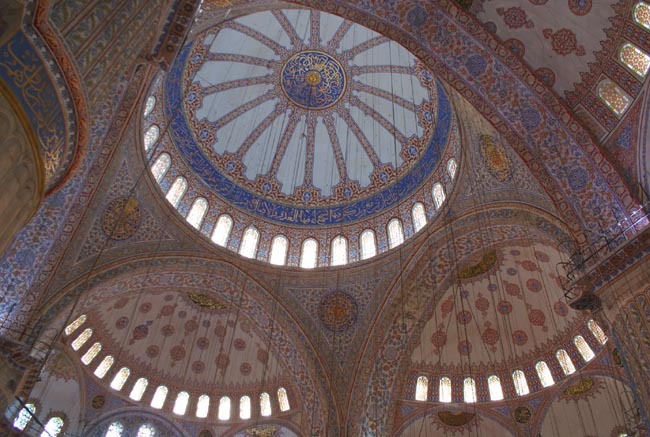 Islamic features, such as the minbar, and four minarets were added. For almost 500 years Hagia Sophia was the principal mosque of Istanbul and served as a model for many other Ottoman mosques, such as the Blue Mosque. It remained a mosque until 1935, when it was converted into a museum by the Republic of Turkey. The Blue Mosque was built by Sultan Ahmet the First in 1609, just near the Hagia Sophia, on the site of the ancient hippodrome and Byzantine imperial palace. Sultan Ahmet died one year before the Mosque completion, at the age of 27, and he is buried near the Mosque with his wife and three sons. The monument has cascading domes and six slender minarets. Sultan Ahmet I wished to build an Islamic place of worship that would be even better than the Hagia Sophia. The two great architectural achievements now stand next to each other in Istanbul’s main square.